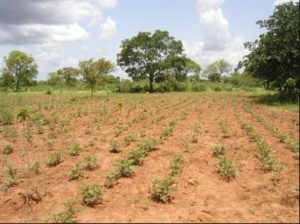 The meaning of the term is simple enough: renewing forest cover by planting seeds, seedlings or young trees. But in the context of climate change, the term carries a more loaded meaning. Besides providing shelter and food for millions of species, sustaining biodiversity, and protecting watersheds, trees absorb CO2 from the atmosphere helping to reduce emission of greenhouse gases (GHGs) and to avoid dangerous levels of global warming. The forests act to offset the CO2 emitted from our burning of fossil fuels and other activities. Of course, cutting down trees releases that CO2 back into the atmosphere, to our detriment. One of the advantages of reforestation as a GHG mitigation action is that it is much cheaper than alternative steps, such as converting from use of fossil fuels to carbon-free sources of power. For your area, determine whether some trees are better than others in reforestation for fighting climate change. How much CO2 is absorbed by a hectare (2.47 acres) of forests in your area over a month, a year, a decade. How much would it cost to reforest a hectare (2.47 acres) of land in your area and how does that cost compare with alternative means of reducing CO2.